1m Roof Canopy which is additional to above dimensions. Eurovudas Bellac Log Cabin: The Eurovudas Bellac Log Cabin is a versatile log cabin with lots of options. The cabin comes in seven different sizes, from 3m x 3m up to 5m x 5m. Wall logs are 34mm thick with quality glass windows and doors as standard. The 19mm thick roof boards come with the option of either shed roof felt, or a combination of shed felt and bitumen roofing shingles in black or green. The cabin can also be built in the reverse configuration of that shown in image, simply by altering the configuration during installation. 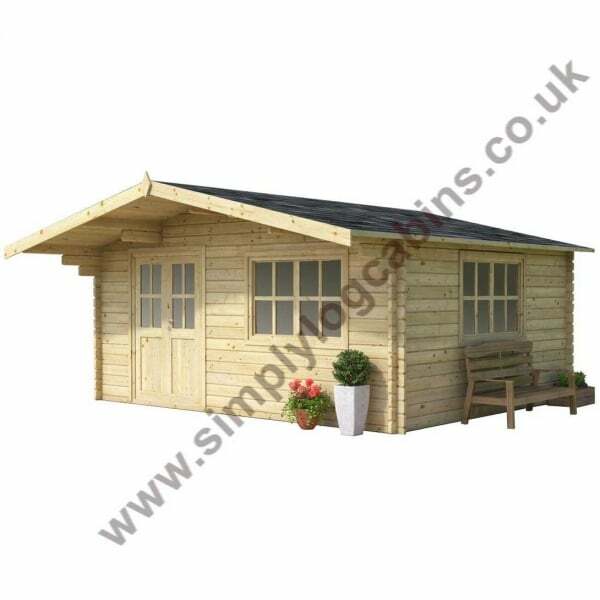 Smaller sizes of this cabin come with a double window in the side, single window in the front, and double doors. Larger sizes have a double window in the side, double window in the front, and double doors. A light and airy cabin with a cosy interior, the Bellac is a great choice for any outdoor area and is sure to provide years of use. The traditional nordic build style of this cabin creates an easy to assemble and extremely sturdy structure. The Eurovudas range also feature chalet corner jointing to give that extra timber jointing for extremely good weather resistance.